In my house we joke about ‘red dinner’ and ‘green dinner’, the words my daughter used when growing up, to describe our most regular meals. 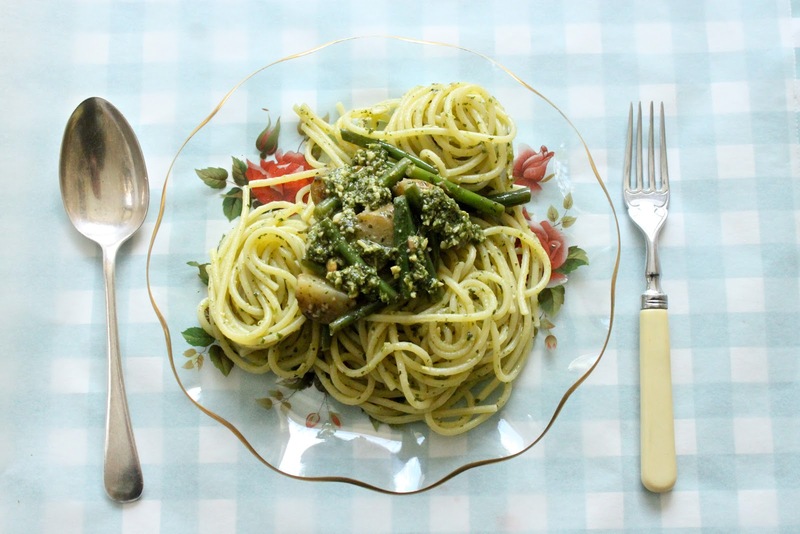 ‘Green dinner’ is, of course, pasta with basil sauce. Pesto sauce in jars grew in popularity during the late 1980s and became a convenient 15 minute ‘just got in from work’ supper. It is probably one of the few ways kids can be persuaded to eat anything green. But there exists a lesser known Genovese (from the Northern Italian town of Genoa, the pesto capital) version of the dish which transforms it into a more complete meal with the addition of new potatoes and green beans. Serves 2 greedy people or 4 light eaters. 45g of parmesan or pecorino, grated. I prefer pecorino and actually, it’s more authentic for pesto from Liguria. 1 tablespoon of pine nuts. Don’t toast them, it ruins the flavour. You want them soft and buttery. New potatoes 50-60g per person, boiled in salt water until tender and sliced. I used Jersey Royals. Method: in a food mixer or pestle, grind the basil leaves, olive oil, garlic, parmesan and sea salt together until it forms a paste. Then add the pine nuts. In the meantime, cook the potatoes by putting them in boiling salted water. Five minutes later start to cook the pasta by pushing it into some salted boiling water. To save energy, you could steam the green beans in a colander on top of the pasta or potatoes. Drain the potatoes, the pasta and the beans. All of these will, with careful planning, be ready at the same instant! Mix the potatoes and beans with some of the pesto sauce, mix the rest of the pesto with the pasta. Serve the potatoes and beans on top of the hot cooked pasta. Add black pepper and more parmesan to taste. Note: if you are pushed for time, use bottled pesto, some brands are pretty good. It’s also a great way of using up left-over boiled new potatoes. *Please spend money on good pasta, not ‘quick cook’. Seriously, it doesn’t cost much more but tastes and cooks so much better. The cheap stuff goes fudgy and won’t cook ‘al dente’, retaining its bite. I buy De Cecco, Barilla or organic pasta which takes at least 11 minutes to cook. That's one of my fave pasta dinners. I often throw in half a pot of creme fraiche as well, just to smooth it up a bit. Had it the first time in Genoa when a friend of mine was dating a multimillionaire Italian and we'd just spend the day at his multimillionaire uncle's horse stud. He then invited us to his family's summer home in Sardinia (which comes with staff!). Then she dumped him. Selfish! Sigh. Giggle. I often make a pizza with this combination of ingredients and it is just wonderful. Lovely recipe and noted about not toasting the pine nuts. I've never done it and wondered if I should so thank you for providing a reason not to. I love your glass plate … perfect for the dish. Enjoying your blog posts and traveling with you by proxy! Love this dish, often wondered if it would improve pesto by toasting the pine nuts. Good to know why not, makes sense. Lovely plate too perfect for this serving. Enjoying your blog and traveling with you by proxy. I LOATHE the fact that people toast pine nuts. It completely ruins the flavour and texture. I don't like toasted nuts/seeds either much but with pine nuts it's particularly awful. Thanks for your comment Slow Cook! 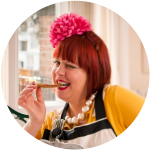 London Bakes: on a pizza…brilliant idea. Will try. Travel Truth…yeah creme fraiche n pesto…for light green dinner. I so want to visit Sardinia. Such a nice blog and i appreciate your all efforts about your thoughts. it's really good work. well done.